How do you give a drawing of a zebra finch a clear personality? How can you use your personal relationships to infuse a drawing with character? 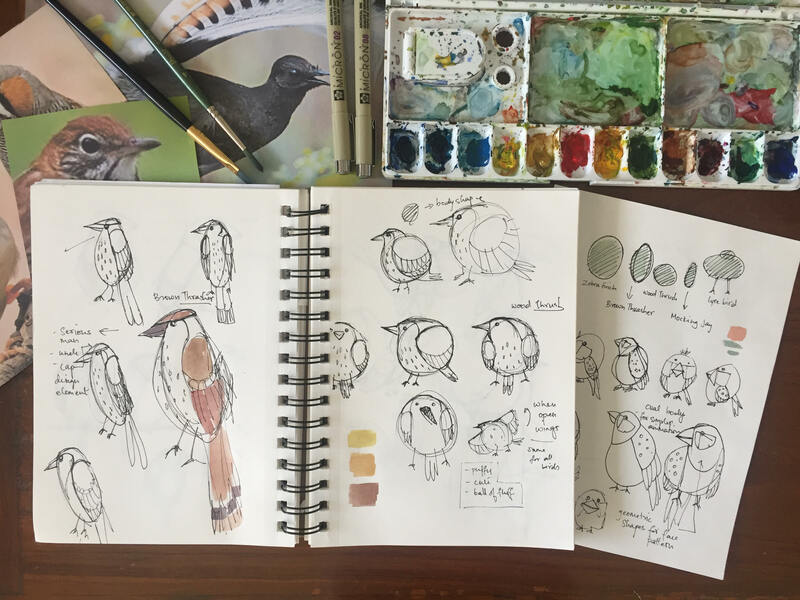 TED-Ed animator Lisa LaBracio, who directed and animated our lesson “How do birds learn to sing?“, sat down with illustrator and character designer Tara Sunil Thomas to discuss the process of designing characters for animation. Finished character designs for ‘How do birds learn to sing?’. Art by Tara Sunil Thomas. LL: How do you define character design? TST: Character design is a simple study of a character and visually designing it in the most appealing way for the target audience. For me, a good character design is a successful balance between a concept that is well suited for the story and a beautiful visual design. What are the first steps you take when designing a character? What sort of research do you do? Generally the director will give a character designer the script and a brief about the characters. Once I read the script I try to imagine these characters as people; usually I try to relate their characteristics to people I know, which makes the process easier for me. I feel this step is important for the audience to relate to a character, especially if the character is not human. I spend a lot of time researching and gathering inspiration before creating my characters. For this lesson, we made Pinterest boards with artists whose work is inspiring (in this case, Lisa and I looked at a lot of Charley Harper’s bird illustrations) and I watched a lot of video footage to study the movement and mannerisms of each bird. This is the most important part as it lays the foundation of the design. 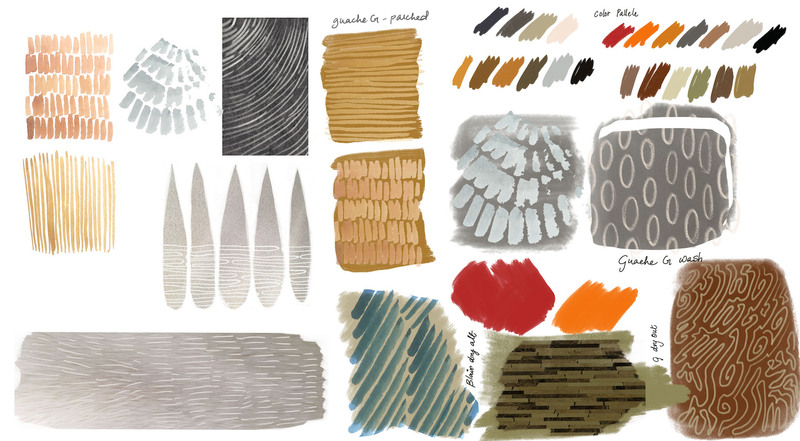 A sample mood board of Tara’s textures and patterns used to create the bird characters. Style guide for the zebra finch character. Art by Tara Sunil Thomas. I love animating your designs because they are like illustrations come to life! Each bird is composed of so many textures and patterns; can you talk about how you take a character from sketch to finished design? I am a traditional person when it comes to this: I use my 0.5 Sakura and Pentel Microns to sketch the basic shapes of characters. I always start by drawing a simple a circle or other simple shapes and then flesh out the character from there. I play with size and proportion to create personality. The zebra finch baby is supposed to be a goofy character, so I designed him with big googly eyes, and extra fluffy feathers to make him cute and fuzzy. I like making patterns using watercolors and then scanning them, and taking photographs of interesting textures around me. Experimenting and creating these patterns is a fun way to get an idea of the color palette and the look you’re going for. Mood boards with the textures and colors always help me visualize the character. For this lesson, I used Adobe Photoshop and TVPaint brushes to put together the mood boards. Once I’m happy with the character sketch on paper, I scan it and apply the patterns digitally to the design using Photoshop. 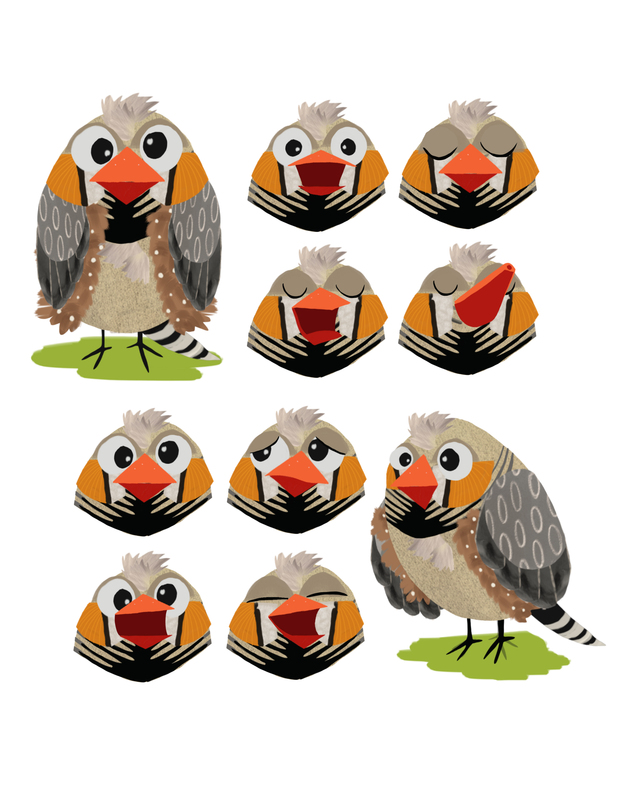 Baby Zebra Finch expression sheet. Art by Tara Sunil Thomas. The type of motions the characters will make and the way in which they will be animated definitely set design limitations from the beginning. For this video, these birds had to be made of simple shapes, yet showcase the unique patterns each bird has. The baby zebra finch was to be the most expressive character, so he had to have a range of emotions and wing positions. In this type of animation, each expression has to be individual created in the design phase in order to be used in the animation phase. When you work with a team on an animated video, everyone has their own style, so it’s important to create a style guide, an expression sheet and a ‘turn-around’ of the characters. These references help the animators and artists keep the characters consistent throughout the entire video. Watch the full TED-Ed Lesson here. Tara is an illustrator and animator from Kerala, India currently based in New York City. Tara loves traditional sketching and digital painting. She is currently working as a freelancer creating character designs and backgrounds for animation companies in New York City. You can see more of her amazing work at www.tarasunilthomas.com. How much do you know about the women who shaped modern physics?